The Norfolk Tides couldn’t make an early lead stick Tuesday night at Harbor Park and fell 8-6 to the Charlotte Knights in front of 4,362 fans. Playing to a 4-2 lead after six innings, the Tides surrendered two runs in each of the last three innings. Steve Johnson, who had pitched brilliantly through 6.0 innings, ran into trouble in the 7th frame when he allowed consecutive hits to lead off the inning. Andrew Garcia cut the deficit in half with a sacrifice fly that scored Jordan Danks and ended the night for Johnson. Wynn Pelzer came on in relief and recorded one out before surrendering an RBI single to Eduardo Escobar that tied the game. Pelzer (0-1, 3.52) remained in the game to start the 8th inning but wasn’t effective. After allowing a leadoff single to Jared Price, the reliever issued two one-out walks before serving up a go-ahead, two-run single to Danks. The Tides jumped ahead early off Charlotte Knights starter Phil Humber, who was pitching on a Major League rehab assignment. Josh Bell got the Tides on the board with a two-run homer in the 1st inning and later added an RBI single in the 3rd inning to make it 3-0. Brandon Snyder followed with an RBI single that scored Bell. Humber settled down to last 5.0 innings and allowed just the four runs on seven hits but didn’t factor into the decision. The White Sox starter struck out five batters and walked just one. The Knights chipped away at the Tides lead, adding a run in the 4th and 6th inning. Dallas McPherson put his team on the board with a towering home run to right field. Lastings Milledge inched the visitors closer with a two-out RBI single in the 6th. Johnson was charged with all four runs (three earned). He allowed seven hits on the night in 6.1 innings. Wes Whisler (3-2, 8.15) picked up the win by tossing 2.0 scoreless innings. Shane Lindsay gave up one run, a two-out RBI double Rhyne Hughes, in 1.0 inning to earn his fourth save of the year. The Knights put up two runs in the 9th inning. Jim Gallagher added an RBI single while McPherson came around to score on an errant pickoff attempt. 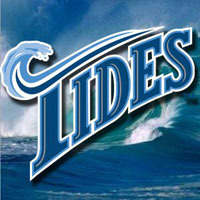 Brendan Harris added a sacrifice fly in the 8th inning for the Tides. The Harbor Park lights went out with two outs in the 9th inning and Brandon Snyder at the plate. Snyder, who represented the tying run, was batting with a 3-2 count at the time. He struck out on the first pitch he saw after the 16 minute delay. The Tides will welcome Gwinnett to Harbor Park Wednesday for the start of a two-game set. The two clubs will pick up their suspended game from July 25. That game was suspended due to rain just before the start of the 5th inning with the score tied 1-1. The regularly-scheduled game will follow its conclusion and last seven innings. RH Rick VandenHurk (9-13, 4.43) will pitch the regularly scheduled game opposite RH Randall Delgado (2-2, 4.15). Pitchers for the suspended game have not been announced.